Creativity sits at the heart of learning. 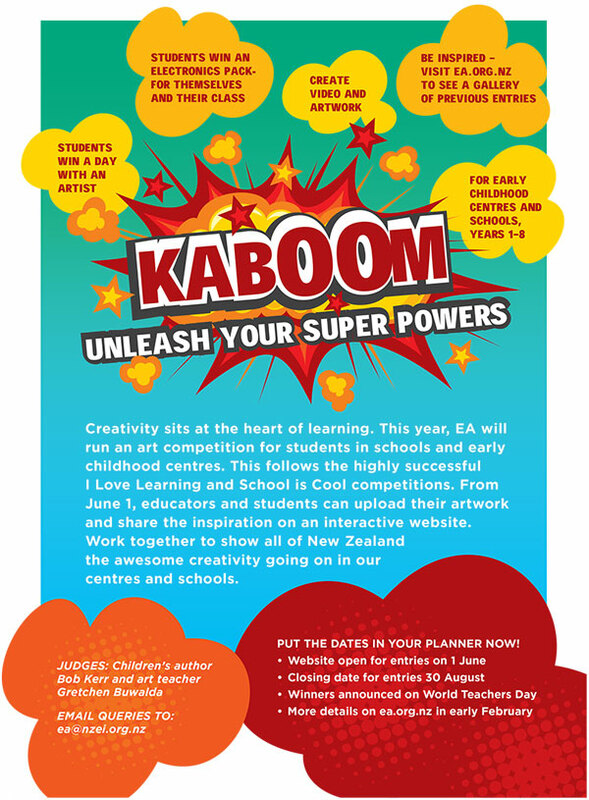 This year, EA is running an art competition for students in schools and early childhood centres. This follows the highly successful I Love Learning and School is Cool competitions. From June 1, educators and students can upload artwork and share the inspiration on an interactive website. Put it in the planner now! Kaboom – unleash your creative superpowers! But what sort of Kaboom? And where will you find your creative superpowers? It’s quite a wide brief, so let’s narrow it down a bit. The important word here is “your”. You won’t find your creativity by making things that look like other people’s art. You’ll find if by showing your street, your house, your school, your friends, or the view out of your window. Imagination can sometimes lead you astray. It can often slide into fantasy that looks like an X-Box game or something made by DreamWorks and that’s not what I will be looking for. I will be looking for a doorway to your world. Art is about looking as much as it is about making, so look closely then tell us what you see, and remember that you will be submitting your art online. Bold bright colours look good on a screen while soft pencil drawings are hard to scan or photograph so keep that in mind. And one other tip. I find it is best to go fast. Do lots of drawings. If a drawing isn’t working start again on another bit of paper. Then spread your drawings out and choose the best bits from each one. And most important – Have fun!